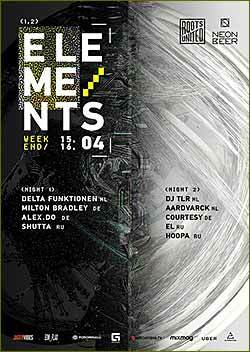 Elements Weekend - a two-day musical event of a new format for the Roots United team, ideologists and creators of Present Perfect Festival. The venue of action will appear before a wide audience for the first time. It is a gas-holder on the embankment of Obvodny Canal - the outstanding work of industrial architecture constructed at the end of the 19th century for storage of illuminating gas. His uniqueness - the special geometry sending by an era of legendary "forts". Exactly here, under a forty-meter dome and only on one day off, the Elements Weekend design will be built. Two one or two nights of a reasoning on communication of contrasts will reveal through musical and visual filling. The concept of minimalism, of the first night will give way to light dynamics and energy of the second. Various in the form, they will enter symbiosis and will be embodied in an integral event. Lyne-ap of a weekend will bring together actors from four European countries. Key techno of a figure of modern Berlin will divide lines with pioneers Dutch a movement rave. The beginners who are regularly arising on a radar of the music press and residents of the St. Petersburg label of Roots United stand the separate block. Art filling of an event is in the hands of the capitalist creative association Eon Flax which activity is engaged in media art and it is known for development of the concept of registration of the Present Perfect Festival, participated in the Boiler Room and Outline Festival projects. The technical realization of an idea of the artists is controlled by specialists of the company 2A Production. Thus, experiment with carrying out under the same roof two various night actions on an esthetics will lead to Elements Weekend - the large-scale project on a joint of music, art and technologies. On the first night Delta Funktionen (Holland), Alex.Do (Germany), Milton Bradley (Germany) and Shutta (Russia) will act. On the second night it is possible ubdt to hear Aardvarck (Holland), DJ of TLR (Holland), Courtesy (Denmark), EL (Russia) and Hoopa (Russia). Culture news archive for 15 April' 2016.